Starbucks is offering a fairly complex new Hot Apple Tea over in Japan this holiday season. The drink features a combination of black tea and rooibos mixed hot with apple juice and diced apples, topped off with whipped cream and a drizzle of cranberry apple sauce. 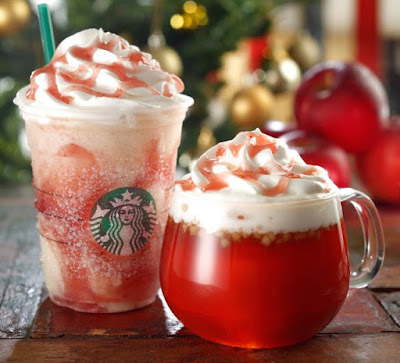 For those who prefer something a bit more chilly, there's also the Apple Caramel Frappuccino featuring a caramel, ice, and milk base marbled with cranberry and apple sauce, topped with whipped cream and a drizzle of cranberry apple sauce. The Starbucks Japan holiday drink menu is rounded out by the more familiar Gingerbread Latte and Crunchy Caramel Toffee Latte.